If your yarn came in a hank rather than a skein, you definitely want to have it rolled into a ball first. You can often ask your local yarn shop (LYS) to roll it for you when you buy it. After you have worked through much of your ball of yarn, it might become loose and flappy. This is a great time to employ the roll your own center pull ball technique so your yarn doesn't become tangled. The center pull ball is great because the ball of yarn won't roll around (and therefore away!). I love being able to roll my own balls for multi-colored projects as well as it keeps the yarn more organized. Just tuck the outside end of the yarn securely into the ball and then it won't unravel either! When you are ready to cast on, the long tail method is quick and easy. Here's a trick for measuring the length of the yarn tail. Not all projects are less than one skein! You frequently have to add more yarn. Check out this video to see how. 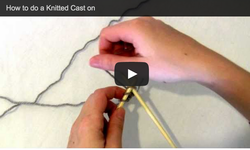 Measuring gauge is one of the most important but most often misunderstood steps in knitting. Learn how to properly measure your gauge or tension. The Cable Cast On produces a cable like edge to your work. It is very similar to the knitted cast on. It actually has nothing to do with cabling. The knitted cast on produces a sturdy edge. If you know how to knit this cast on will be easy. It's great for casting on stitches in the middle of the row. The backwards loop cast on is less sturdy than other cast on methods. But it is very fast and easy and can be used for button holes.